Today, we conclude our look at the shape of band-centric games to come. 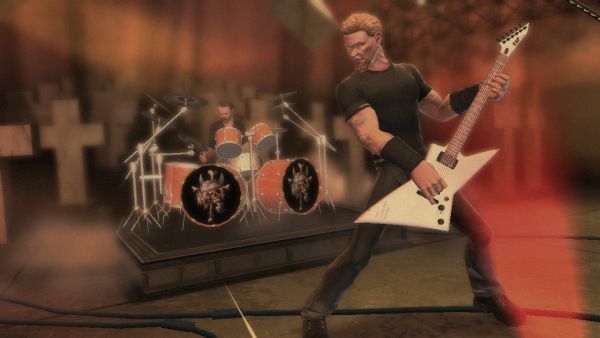 In part one, we identified the qualities that the current band-centric games all share, including high sales, sustained popularity, the hard rock genre, and a lack of previous content in music games. Now, we'll take these traits and see how some of the biggest acts of all time stack up to answer the question: which bands have the best odds at their own video game? Will we see Guitar Hero Bon Jovi? Led Zeppelin Rock Band? We touched on this briefly in part one, but only two other acts come close to the sales record of The Beatles: Elvis Presley and Michael Jackson. The two share similar nicknames: the King of Rock and Roll, and the King of Pop, respectively. Elvis Presley was a musical pioneer with a tremendous influence on the music industry. Michael Jackson topped the charts from his childhood to his untimely death last year. No one would argue that either of the two don't have the body of work and enduring popularity that are required for a music game. However, genre is a problem for both. Pop music is becoming more prevalent in music games, but it's probably still too early for a game filled with it. Perhaps the biggest problem is that both men were known largely as solo acts. Music games are meant to be enjoyed together with friends, and while an occasional song by a solo artist is fun, a game filled with them probably wouldn't work. At first glance, Queen would appear to have everything it takes to have their own music game. Oodles of sales? Check. Sustained popularity? Most five year old kids today know "We Will Rock You". Plus, they are absolutely the right kind of music for a band game, too. But one fact shoots down the chances for Guitar Hero: Queen. The band is already very well represented in previous music games. From "Killer Queen" in the original Guitar Hero to a major DLC release for Rock Band last fall, gamers have already had plenty of chances to enjoy rocking out to the sounds of Queen. In total, there are twelve songs in Rock Band and eight in Guitar Hero. There are plenty more Queen songs that could be used, of course (I would buy the Flash Gordon soundtrack day one! ), but because there's already so much out there, Queen is an unlikely candidate for a new band game. Led Zeppelin has it all, really. They've sold a whopping 200 million albums, and are widely regarded as one of the most influential bands in history. The group disbanded after drummer John Bonham's death in 1980, but their music remains popular three decades later. For many years, Led Zeppelin had a reputation for being strict with their music, not allowing them to be used in commercials, movies, or, for that matter, in any music game to date. The bad news? The band has stated publicly that they will not allow their music in a game, but, then again, they said the same thing about movies for years, too. Let's hope a Led Zeppelin game becomes a reality sooner rather than later. Another huge band, with eight platinum records, Pink Floyd is well known for amazing live performances. Given the visual nature and storytelling potential of the music game medium, Pink Floyd might be the best choice for their own game. Imagine playing the entire "Dark Side of the Moon" album with no breaks, or seeing the story behind "The Wall" played out in background images. There's great potential here for what could be a standard-setting, definitive music game. Add in the fact that there have been no Pink Floyd songs in either Rock Band or Guitar Hero, and Pink Floyd becomes one of the front runners for a future music game. Best of all, the band is apparently "considering it". The Rolling Stones are one of the few bands on the list to keep making new music for decades. Vocalist Mick Jagger has enormous star power, with a steady solo career apart from the band. The band has remained active, touring as recently as 2007. They are the second highest ranked group on Billboard's All-Time Hot 100 chart, topped only by The Beatles. With one exception, all signs point to a Rolling Stones game. That exception? Ten Rolling Stones songs are already available in music games, including a sizable DLC pack for Guitar Hero 5. Certainly, there are plenty more great tunes available, but it's still worth mentioning.